Never use running water. Do not dip up & down in water. Gently remove tangles with fingers or pick comb. Add 1 tablespoon Synthetic Wig Shampoo to a basin of cool water. Soak for 5 to 10 minutes. Do not rub or dip. Basin of clean cool water to rinse thoroughly. Be sure to rinse until all shampoo is removed, as improper rinsing could result in damage. Dab gently with towel to remove excess water. Do not squeeze or twist. Do not brush or comb while wet as it may stretch or otherwise damage the fiber. Never put a wet wig on a solid head stand or block as it will stretch the cap. Hang to air dry or put on a wig stand. If you want bangs then leave some out. If you want hair to comb over the 3/4 cap fall then leave some out. 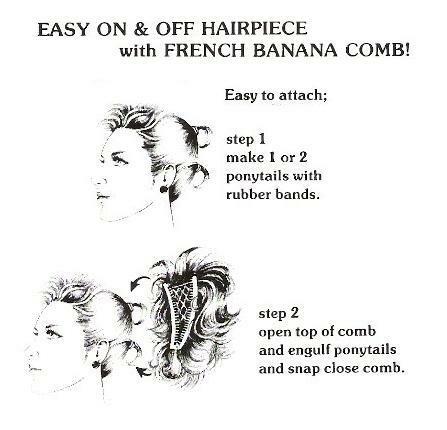 Otherwise pull hair into a ponytail. The top comb should be placed back into the hair 1″ – 2″ behind the front hairline. The bottom comb should be put in near the hairline at the nape. You will find that you have a very secure fit. 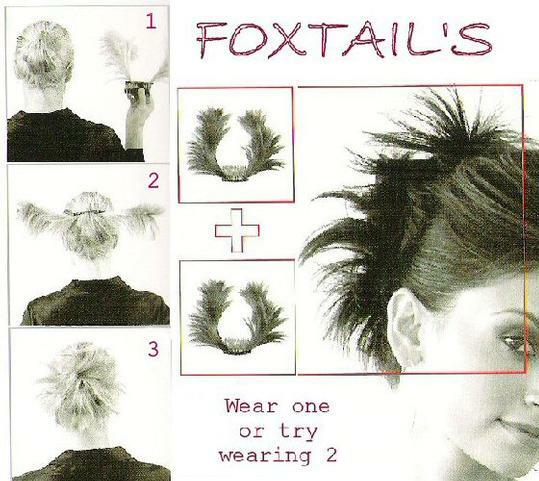 Put your hair in two small verital ponytails (one 1″ below the other). Two ponytails will help to put all your hair inside the combs and make for a more secure fit. Leaving the bottom comb closed engulf both ponytails into the banana comb and close the top. Put our own hair in a ponytail. 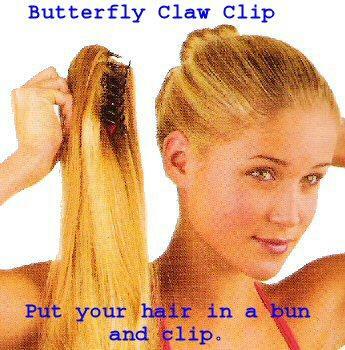 The Claw Clip is just like a Butterfly Comb Clip, open the claws and place over the ponytail and let close. Note, if you have a lot of hair put it in two vertical ponytails (one just below the other). First put your hair in a ponytail or bun. 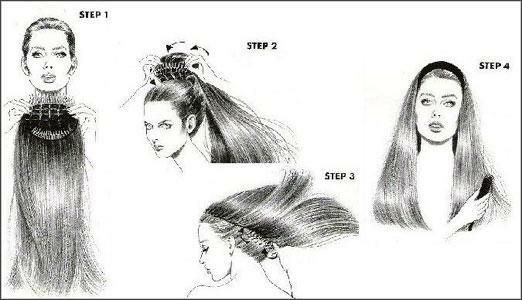 Then, holding the piece by the comb, secure it under the band of the ponytail or bun. Wrap one side of the piece once around the top of your ponytail or bun, and then do the same with the other side. Comb or fluff for the look you desire. Fit most children 8 to 14 years of age. Also called Ultra Petite by some manufacturers, is the smallest size available. Very few wigs come in this off-the-shelf size. This size is usually for a child but may qualify for a very small woman. See about sizing for further help. Petite is a very command smaller size for petite women. The closest measurement to fall in this in-between-size is 21 1/4″. This qualifies you for petite or Average in most cases. Average is usually quantified as 21 1/2″. As you can see there is very little size difference in these measurements. Fortunately, 97% of all wigs are sold in the Average size. Average Large is 22 1/2 for most manufacturers. Very few wigs come in this size and those that are made in this size are short styles for the most part. The large size calls for a 23″ to 24″ head size and once again, it is usually made in short styles so see *sizing for further HELP! Remember, the sizing is just a guideline. All manufacturerers have their own sizing techniques. There are many simple methods to make your wig feel more secure on your head. There are elasitic pull fasteners at the back of the wig behind the ears. For starters, pulling these fasteners to a comfortable position is usually all it takes to make your wig a better fit. THIS IS JUST A GUIDELINE. WIGS DO HAVE SOME STRETCH IN THEM. LOOSE IS BETTER THAN TOO TIGHT. Wig circumference can be adjusted up to 1″ larger or smaller to ensure a secure fit. For those who need professional sizing! This can be done and we make these amendments to our customers wigs at our store in Tigard, Oregon. For those who are good at making tucks in the waist of pants or skirts – it is pretty much the same type of adjustment. You just double down or cut out the area not needed and sew it together again.